We have all new twists and turns this year with scares around every corner. Twisted Nightmares is a indoor haunted attraction that is located in the foothills of the Pelham Valley where most people dare to wonder. Each year we strive to crank up the intensity of our haunt, and we promise you will want to come back. Our haunt is put together by the Helping Hands & Giving Hearts of TN that is a non-profit organization that helps people who are needing help financially during a tragic time in their life. Our mission is to help the surrounding areas with financial support until the individuals can get back on their feet. 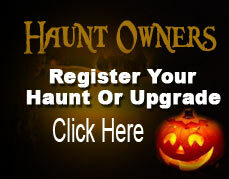 Our organization is 100% non profit and look forward to you visiting our haunted house. We invite you to come along with us and experience the most twisted nightmares you will ever think of. We promise you won't be disappointed. Take Exit 127 (Pelham Exit) then continue towards Pelham. You should go past the Stuckey's Market on your right. Once you continue on this road you will come to a 4-Way stop that has a caution light. Turn Right at the 4-way stop and continue on that road for 0.5 miles and you should see us on the right hand side of the road. Be sure to keep an eye out for our signs and lights flashing.